Welcome to Aaduki! We understand the nature of the photographic industry and the risks photographers face in running their own business. With more than ten years’ experience in the market, we try to find the right cover at the right price for you. That is why we are recommended and supported by The Societies of Photographers. Most providers of insurance to photographers use only one insurance company to underwrite the policy. We have a panel of insurers that underwrite the Aaduki scheme and this means that we can truly search our market for the best deal for you offering the right cover at a realistic price! We offer a range of insurance covers including stand-alone public liability and professional indemnity insurance. We can even arrange cover on and for unmanned aerial vehicles (commonly called ‘drones’) and we can arrange travel insurance if you are visiting places that the Government advise you not to visit! We are happy to discuss a tailor-made policy, moulding cover around you and your business, rather than offering a ‘one size fits all package’. We are happy to provide cover to the professional, semi-professional and enthusiastic amateur photographer. Quotations are available twenty-four hours a day from our website www.aaduki.com/THES or, if you are a member, from our Societies Member page www.aaduki.com/thesdiscount. If you prefer to discuss your insurance needs with a real person we are more than happy to speak to you; either email us your contact details with a note of when it is convenient to call you and we will do our best to call you back, or message us via our ‘Live Chat’ facility on the website (if it is open at the time), or call us on 020 3633 2280. If you are looking to cover your drone, or your use of a drone, or if you are looking for travel insurance to high risk areas we will need to speak with you before we can give you a quote. For the majority of times insurance cover can commence immediately without the need for completed proposal forms. If you are a limited company or business partnership however, in order to comply with regulation under The Insurance Act 2015 we will need for you to sign and return a Terms of Business Agreement but we can usually allow a period of time after you have taken out a policy with us for this to be returned to us. You’ll find us enthusiastic to do business with you and efficient but also very approachable and friendly so why not get in touch with us today for a free no obligation quote. Many photographers, video makers and film makers earn a living, or contribute to their households, by undertaking professional work on behalf of clients. This can range from the odd wedding right through to daily aerial photography or filming for commercial clients making use of a drone. In some instances, liability insurance is compulsory by Law, but even if insurance is not a legal requirement, if your income is dependent on your equipment it is important that you do all that you can to safeguard it against damage and theft, and, should the worse happen, by having it insured! Imagine also of the consequences if you are held legally liable for injury or damage to a third-party or their property (other than employees); now imagine the consequences that could follow if you do not have public liability insurance! If you have any employees you are legally obliged to hold employers’ liability insurance for claims that may be brought against you by an employee for injury, illness or disease sustained as a direct result of their employment by you. As soon as you agree to do a shoot you are contractually obliged to produce photos to an acceptable standard. If your client is not happy with the quality of your work you need professional indemnity to assist you with a complaint. Not sure what insurance you need? Call us to discuss this further and we will be happy to advise you, alternatively you may find the information on our website useful in this respect too. 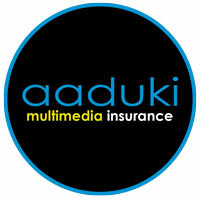 Welcome to Aaduki – we make your insurance easier to understand. We are able to cover the cost of rebuilding your studio plus we can also provide cover for shop fronts, fixed glass, fixtures and fittings and tenants improvements under this section. Your fixtures and fittings could include shelving and cupboards that you have fitted to the internal structure of the building. Where you rent the building from a landlord, tenants improvements would provide cover for any improvements you have made to the building in order to make it suitable for your business such as the cost of installing appropriate ceilings and flooring or even a cove. You can cover all of your photographic equipment, video making equipment, computer equipment, hired equipment, stock and materials, goods held in trust, props sets and wardrobe, and other business property that you may have. Cover will be at your premises but this can also be arranged to suit your needs when equipment is taken out of the studio regardless of whether you need ‘away’ cover to be United Kingdom, European Union, or World wide. To help with those photographers who need a little cover outside the UK or EU where we provide cover in the UK or EU cover will usually extend to include cover outside the UK or EU for either 45 or 60 days free of charge. Cover for theft from an unattended vehicle is standard but there are some limitations so speak to us in detail about this. We are also able to provide short-term cover for equipment that you may need to hire in for a specific contract – even if you hold no other insurance policy with us. It is sometimes expected that cover for photographic equipment is provided on household insurance policies. This is not always the case. If you don’t have it in writing from your household insurer that they understand that you use the equipment for work or business purposes, chances are, regardless of whether it is specifically listed in the policy, the equipment is not insured. This cover is popular with studios. For example, if your studio burns down or floods, you will either have to hire another premises to keep working whilst the damage is repaired, or stop your business until the current premises are back up and running. Business interruption helps with the costs towards your continuing your business. This could include any gross profit you lose as a result of the insured occurrence or the costs in hiring alternative studio premises. Business money helps towards money that you may lose as a result of suffering a fatal fire or flood or being the victim of a robbery. Public and Products Liability protects you for your legal liability for injury to third parties (other than employees), and damage to property. The standard cover (called limit of indemnity), is £2,000,000 each and every claim (in total per policy period in respect of Products Liability). If you require a higher limit of indemnity, please let us know and we will be more than happy to quote for a policy with a higher limit if we are able or if your needs change during the policy year just contact us throughout the year to change your cover for you. Employers’ liability insurance protects you against your legal liability for injury, illness or disease to any employee, labour only sub-contractors and persons under work experience or training schemes. Cover is provided for £10,000,000. Firstly, it is important to point out that employers’ liability insurance does not provide any cover whatsoever to an employee – it provides cover to the policyholder for claims that may be brought against the policyholder by an employee following injury whilst undertaking their duties of employment. For the purposes of the legislation regarding compulsory employers’ liability insurance it is not a requirement that a person working for you is paid for their time in order to be considered an employee. You are not required to hold Employers’ Liability insurance when you employ Bona Fide Sub Contractors to undertake work for you but you do have a legal obligation to hold the insurance if you use a Labour Only Sub Contractor or any other paid/unpaid person. The rules differ for limited companies and also if you are employing a close member of your family; these are explained below under the relevant headers. The following information is intended to explain the different types of sub-contractors and how they are categorised by insurance companies for purposes of determining whether employers’ liability insurance is required; if you have any questions please contact us. Bona Fide Sub Contractors are generally deemed to be contractors who work without direction from the policyholder. They will hold their own insurance and usually provide their own materials and tools. As long as they are not working under the direction of the policyholder, have their own legal liabilities and insure for themselves, there is no need to include them in the count of employees. Please note that it is a condition of most insurance policies that you check that Bona Fide Sub Contractors have their own liability cover to at least the same limit of indemnity as you hold under your policy before you appoint them and that you keep a written copy of this evidence. 2) Provide own materials and equipment? 3) Have the authority to employ others? 4) Get paid by contract rather than on an ongoing hourly or daily rate? 5) Have their own insurance arrangements to protect themselves and the principal? 6) Determine the way in which the work is completed? Labour only Sub Contractors should be treated as employees for the purposes of cover under this type of insurance. Generally they work under your direction and do not provide their own material or tools (with the exception of small hand tools). You do not have a need to hold employers’ liability where the person working with you is a direct close family member, i.e. mother, father, daughter, son; anyone outside of this category (a nephew for example), would mean that you have an obligation to hold employers’ liability insurance. These persons are classed as employees and it is likely that the school/college will insist that you hold employers’ liability insurance (and prove that to them), as you have a legal obligation to hold such cover when using the services of a work experience student or others on similar work placements. It is immaterial if the person working for you is a Bona Fide Sub Contractor, a Labour Only Sub Contractor, or a close family member. Limited companies are legal entities in their own right and it is the limited company, not you personally, that technically employs persons (including employing you as a director). All limited companies have a legal obligation to hold employers’ liability insurance. The only exception to this legal requirement is a limited company with only one working person who is a director and that individual owns at least fifty-one per cent of the issued share capital, i.e. there are no other persons whatsoever doing any work in the company. If anyone else whatsoever (including the company secretary) does any work whatsoever in the company, then the limited company by Law must hold employers’ liability insurance. For the avoidance of doubt, the issues surrounding whether a person is a Bona Fide Sub Contractor, a Labour Only Sub Contractor, a close family member or other employee or work experience student, do not arise with limited companies as the Law allows for only one opt out as described above. The Government has introduced regulations that require Insurers to publish data on employers’ liability policies which are designed to simply allow a claimant to trace which insurer provides or provided cover to an individual employer at any given time. In the same way as insurers are required to submit insurance details to the DVLA for motor insurance policies, it is regulation that insurers must supply to the Employers’ Liability Tracing Office details about you and your employers’ liability insurance. ELTO has created an Employers’ Liability Database so that a central record is made of all employers’ liability policies; these are then being cross referenced against records held by HM Revenue & Customs. The authorities have decided that the easiest way to track this information is to make a link to the tax system and therefore the Tracing Office is requiring insurers to provide to them your individual Employer Reference Number. This information must be submitted to ELTO by your Insurer without delay in a timely manner in order to comply with the regulations. We believe it is inevitable that eventually those businesses that do not hold employer’s liability insurance (which is a statutory requirement for most businesses), but do pay PAYE will be ‘instantly fined and convicted’ as is currently happening with the registered keepers of uninsured motor vehicles which are not registered ‘off road’. Please be aware that the Employers’ Liability Tracing Office regulations differ from the Employers’ Liability (Compulsory Insurance) Regulations 1998 and where the latter requires you to hold employers’ liability insurance, you may on the other hand be exempt from holding the Employer Reference Number. If you are exempt from holding an Employer Reference Number all you need to do is to advise us of that. If you are not exempt you will have a unique individual Employer Reference Number – purely as an example it will look something like “470/JY67847”. If you are unsure where to find the Employer Reference Number please seek advice from your accountant or local tax office. Mandatory information – what is required? Below is a summary of the information we must collect from you to help you provide the correct information. Professional indemnity provides you with financial protection for your business, such as the costs of defending a claim made against you. Claims against you as can occur where a client suffers a financial loss as a result of alleged errors or omissions on your part. You may unfairly be sued by, or receive a claim from, a client who is merely dissatisfied but has no valid claim. This could involve you in substantial legal costs and non-productive time even if you were successful in defending a claim in Court. From the legal standpoint, the position with regard to the ‘duty of care’ is the same for any professional. Please note that all insurers are different and terms and conditions can differ from one policy to the next but most, if not all, insurers will require you to check that Bona Fide Sub Contractors have their own cover to at least the same limit of indemnity and standard of cover as that held by you and that such evidence is retained in writing for future reference. It is in your interest to ask for such proof in any case; why should you, as a professional individual, meet the costs of insuring yourself correctly and then employ a Bona Fide Sub Contractor who intends to try and rely on the cover you have bought? You are effectively paying part of their business operating costs! If a customer of yours asks you if you have insurance would you reply stating that they must insure your business for the work that they are paying you to undertake? Members of The Societies of Photographers can now get 13 months’ cover (not 12 but 13), for public liability and professional indemnity for a price that is exclusive to members. Call us on 020 3633 2280 for details. Also available are discounted member rates for your equipment insurance.